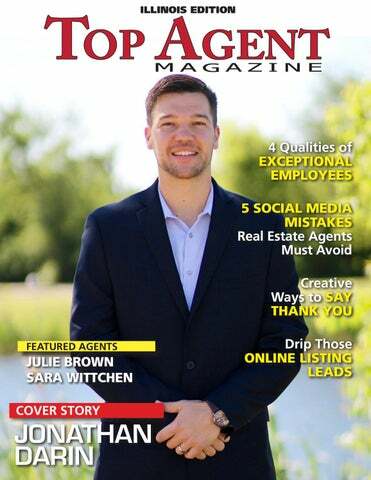 on being featured for the state of Illinois in Top Agent Magazine! Daniel Andersen | Mortgage Adviser | NMLS# 227402 P: 708-261-2665 | F: 630-908-3668 Dan@RatesbyDan.com AndersenTeamML.com www. Jonathan Darin has quickly become a rising star in the industry, and was recently honored with the Coldwell Banker 30 under 30 award, which recognizes young agents for their sales achievements and their community involvement. To learn more about Jonathan Darin call (708) 473- 5241, email Jonathan@HomesbyJDT.com or visit JDHomeSource.com and facebook.com/jdarinteam www. Week Eight: If you’re not quite ready to list your property, we have a system called “sell the sizzle before the steak.” I know it sounds a little corny, but we can discretely present that your home might be available to our database of buyers. This helps us to do a little pre-marketing prior to a full commitment of our complete marketing plan. If you are interested in this service, please don’t hesitate to give us a call. Week Nine: Did you know that we have a policy where no real estate agent will be allowed to negotiate with you in person? We do this because many times real estate agents can be very forceful in the presentation of offers from their clients. We ask for that offer to be presented to us, and we will spend as much time as you need with just us - your representatives. This eliminates awkward meetings where you need more time to think, and the buyer’s agent is pushing for an answer. We believe that selling a home should not only be massively profitable but also fun. If you’d like more ideas on how we differ from the competition, email or call me at your convenience. All contacts will be kept confidential. Well, I hope you get the idea that we’re trying to start a conversation with that potential seller instead of letting them fall through the cracks. A drip email campaign for a seller is similar to the campaign for buyers. It’s necessary for listing leads since the majority of information requests come via the web with incorrect or inoperable phone numbers. The only way to get these leads talking is to present them better value than everyone else. Copyright©, 2015 Walter Sanford. All rights reserved. pricing, marketing, negotiations, contract, inspection, more negotiations and closing.” She walks through inspection reports in detail with clients, discuss which requests are fair to honor for the buyer. She also stays in touch after closing, giving pies at Thanksgiving and keeping up on their lives through email, social media, and handwritten notes. She’s also active in her community, having raised her two children there, where she was very involved in local sports and schools. Given her sales and marketing background, Julie particularly enjoys listings in the community she loves. 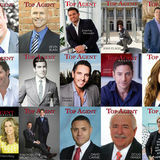 “@properties is the best marketing company I’ve ever worked for,” says Julie. “We do comprehensive social media and online marketing, but I also do a lot of marketing prior to activating a listing.” Julie describes the “friendly competition” she enjoys with local @properties agents who help find buyers for their colleagues’ listings through the @ properties agent app, which reaches 2,600 @properties agents in both the city and suburbs with one “tweet.” She also takes advantage of a Facebook page for networking with other local agents. Julie’s thorough, pre-market work expedites sales and eases the stress for sellers and buyers. Meanwhile, Julie is also in the empathy business. “I believe that every real estate agent should list and sell their home once 10 years so they remember what it feels like!” says Julie. “I just sold mine two years ago, so I know.” All the hard work is more than worth it, though, when Julie witnesses the happiness of clients at the closing table. Julie wants anyone she works with – whether they’re a buyer, a seller or another agent – to know how much passion she has for her work. “I really do enjoy it and all the interesting things that come into play every day.” Looking both back and to the future, Julie considers herself fortunate that 99% of the people she works with are past clients or referrals. She considers it her pleasure do well by the people who trust her while empowering her team members to enjoy their own success helping people through real estate. Most top real estate agents find ways to welcome their clients to their new home. A common theme is a bottle of wine and some wine glasses for that first post-threshold toast, or a bouquet of flowers to brighten up that empty living space until the furniture arrives. But are you truly being as creative as you can with your appreciation? Here are some innovative gift ideas that will truly keep you front of mind with your valued customers and assure their gratitude and repeat business, not to mention a slew of referrals. or Amazon Fire Stick? There’s a good chance your clients will not have their cable service up and running for a few days, and this is an excellent way for them to enjoy their television before they get that connection going. Bundle it up in a basket with some DVD’s for the kids, and don’t forget all necessary cables. rycloth bathrobes and a basket filled with highend his and her body scrubs, bubble bath and other luxurious pampering items can make the first night in a new home feel like a check-in at a fabulous resort and make the memory of that first night one to cherish. Again, don’t forget the kids! certain in advance dietary preferences and restrictions, and have a wonderful, healthy meal delivered on move-in night. To complete the magic, provide brand new plates, silverware and glassware to serve it all on. stack of fluffy pool towels is always appreciated and will be used by family and friends for years to come. Additionally, acrylic stemware for celebrating safely can be provided alongside them. 5. If it’s winter time and the home has a fireplace, make sure there’s plenty of wood to burn. Some fireplace accessories and a log holder will certainly make your clients appreciate you on every chilly night to come.